First submission for our new theme Protest! : Poetry by Linda M. Crate. Take a read below! human beings instead of property. they want profits, i only want to live; i want to achieve my dreams and help the other dreamers off their knees because the nightmares we endure are so useless and meaningless—all the obstacles we've been jumping over aren't necessary, but no one cares about you when you are poor; it's always held against you like a character flaw—it's no crime to be rich, though, to be greedy; to extort your neighbor and kill your friend and that makes no sense to me—i don't want to live in a world so ugly and so evil, i was born to smash the masks of these false prophets; i refuse to accept them and their crimes against humanity—there is no greater good, one person suffering is unacceptable; i am tired of people thinking it's okay should one person suffer for the rest of us—who are you to demand a sacrificial lamb or hero? who are you to decide your life matters more? i respect no one who thinks they're superior to anyone else, we all matter, we all bleed the same, we all have hopes and dreams, and we all want to live; and damn anyone who would take the lives from our bones and marrow before our time. you're no better than those you attempt to strip the humanity from, you are no better than the disabled and injured; you are no better than the lgbtq community you so despise, your religion makes you superior to none, and your path isn't the only path to walk; i am so tired of children in cages and immigrants being treated like animals when people wouldn't even treat their pets in such an evil way—you cannot tell me that you are for humanity when you are so cruel to other human beings, and i am so exhausted of the ugliness people spew at one another; we have the ability to lift one another up with our deeds and our words—so why are these wounded hearts being ignored and swept under the rug? why is puerto rico still struggling? why are their deaths not being taken seriously? i protest all the ugliness in this world, i protest the apathy of mankind, i protest cruelty of any kind; i will shatter these nightmares and monsters until only light can pour through and everyone can know the mark of kindness upon their souls—because so many people struggle and suffer in silence, so many people die without being remembered, we have no right to forget them; i refuse to let them go, i refuse to let them be numbers instead of faces and names and hearts—if anyone must be caged then let it be the evil men who would put a price on a human life because we are all worth much more than any sum of money could give us. but we're not insects you'll crush. or tv show or book? Linda M. Crate is a Pennsylvanian native born in Pittsburgh yet raised in the rural town of Conneautville. Her poetry, short stories, articles, and reviews have been published in a myriad of magazines both online and in print. She has four published chapbooks A Mermaid Crashing Into Dawn (Fowlpox Press - June 2013), Less Than A Man (The Camel Saloon - January 2014), If Tomorrow Never Comes (Scars Publications, August 2016), and My Wings Were Made to Fly (Flutter Press, September 2017). Her fantasy novel Blood & Magic was published in March 2015. The second novel of this series Dragons & Magic was published in October 2015. The third of the seven book series Centaurs & Magic was published November 2016. Her novel Corvids & Magic was published March 2017. Check her out on Twitter, Instagram, and Facebook ! 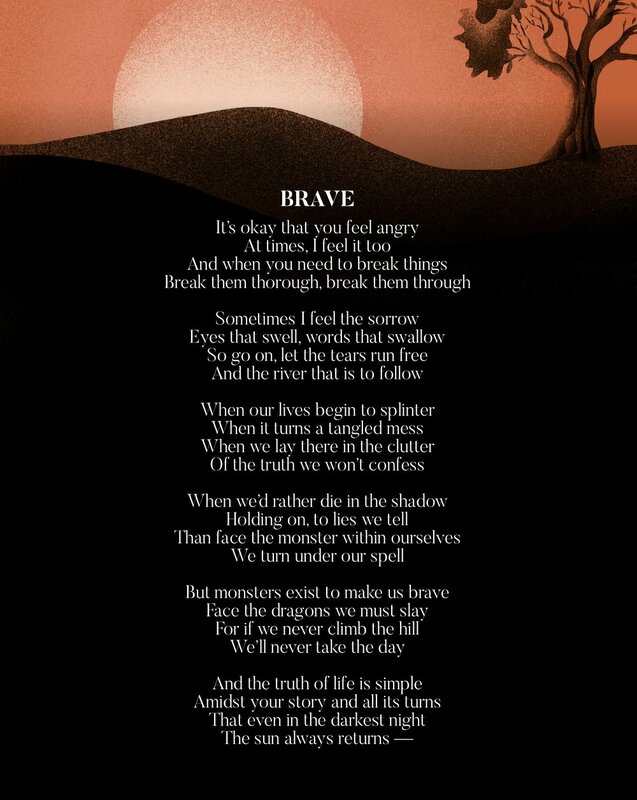 LateHw today: a poem "Brave" by Derek Koehler. Check out more of Derek's work on Twitter and Insta! "Interlude in Northern New Zealand"
LateHW today: a poem by Kayla Tostevin. I recognized it settling in my gut. them for the next time we talk about us. You can follow Kayla Tostevin on Instagram. Late HW today: Poetry by Linda M. Crate! i don't need all the vulnerability i once was. why you discredited me for everything i was.